Today Nashville is one of the three major recording centers in the United States. It has developed beyond its base in country music to become what it has long proclaimed itself to be: Music City USA. The rise of Nashville in the years after the Second World War was meteoric and has usually been explained in terms of 'The Nashville Sound.' It's central to country music mythology that the Nashville Sound enabled country music to shake off its regionality and colonize the mid ground once occupied by Easy Listening music. While that's true to an extent, it ignores much of what went on in Nashville before the Nashville Sound was born in the late Fifties. In particular, it ignores the origins of the Nashville music business in the years after the Second World War and the fact that country music was never the only music played there. In 1945, as the War ended, Nashville had no pro-quality studios, no career session men, no record companies, and only one or two music publishers. As late as 1946, Los Angeles, Atlanta, Cincinnati, and especially Chicago were considered the hubs of the country music business. That all changed very quickly, and it went hand-in-hand with the growing pre-eminence of the Grand Ole Opry on Nashville's WSM. There were hundreds of radio barn dances in the Forties, but the Opry attracted the stars that the post-War country audience wanted to hear, and from 1943 it alone had the precious 30 minutes of coast-to-coast network airtime. The stars moved to Nashville, and the business followed. The Opry's role in Nashville's growth can't be understated, but it tends to obscure the role of another local high megawattage station, WLAC, in fostering an altogether different Nashville Sound. 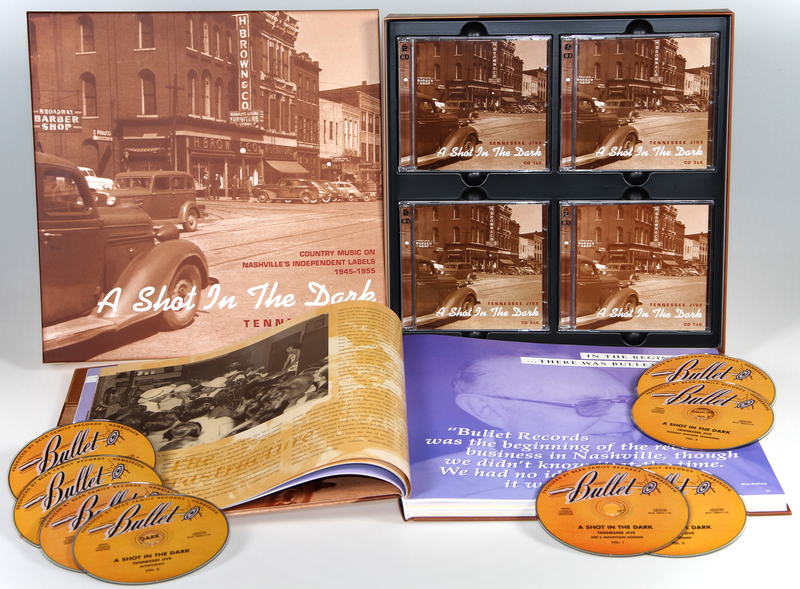 At night, WLAC's R&B programming blanketed the eastern United States, laying the groundwork for a thriving black music recording scene in Nashville that lasted well into the Seventies. There was some interaction between Nashville's country music scene and black music scene, but in general they existed as parallel universes. By the mid-Fifties, most of the major recording companies were represented on a permanent basis in Nashville. During the preceding ten years, though, the only permanent record company representation was a handful of small local labels. 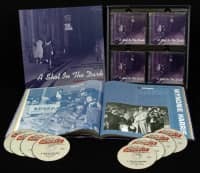 While the majors saw Nashville solely in terms of country music, the independent labels bridged the two solitudes of black and white music, and recorded much else besides, including pop orchestras and gospel music. In other words, they reflected the Nashville music scene as it really was. 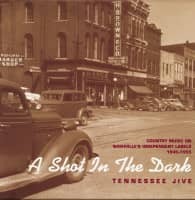 This is an attempt to document the vital but forgotten years between 1945 and 1955 which saw the rise of Nashville as a viable recording centre. The story is bookended by two events that barely rated a mention at the time. In December 1945, Bullet Records cut its first session, and in January 1956 Elvis Presley came to Nashville to make his first recordings for RCA, Heartbreak Hotel among them. Instead of telling the story in terms of big stars and big record companies, the focus here is on the local heroes and local labels who laid the groundwork for so much of what happened in the years ahead. 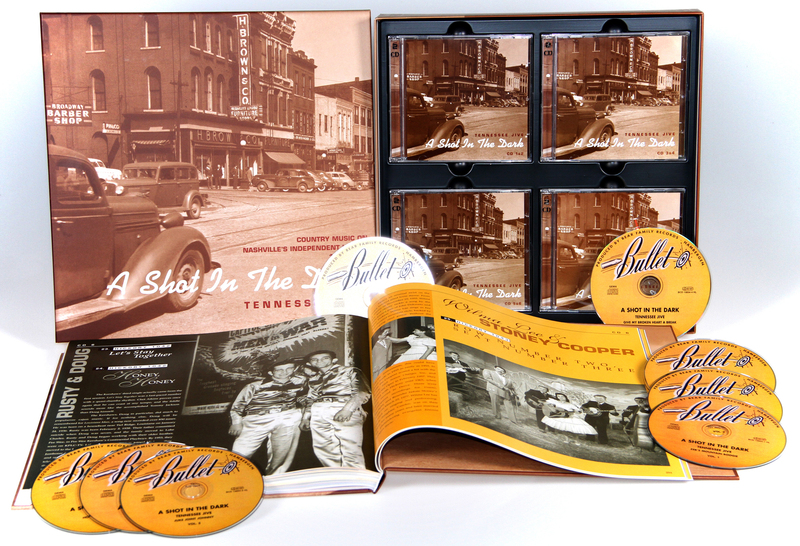 The performers on the two accompanying CD sets were very often the ones who played for white Nashvillians while the Opry stars were touring the country all week or for black Nashvillians in the local clubs and bars. The record labels profiled here were all based in Nashville or its immediate vicinity, and were run by a few influential, optimistic entrepreneurs, who shared the freewheeling, outlaw mentality of the independent music business. Some were dreamers, some were realists, and some were scam artists who hoped to capitalize on the music business's reputation for quick profits. 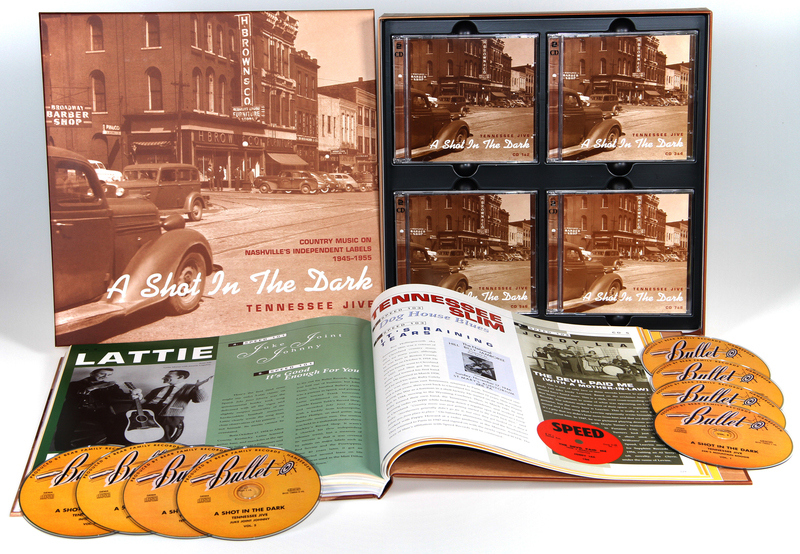 Largely forgotten today, the little labels like Bullet, Nashboro, Tennessee, and Republic played an important role in making 'Nashville' synonymous with 'music,' and they gave the all-important first break to many big artists from Chet Atkins to B.B. King. They built the substratum on which Nashville's fabled music business grew. They also accounted for several national hits. When Near You on Bullet Records became the biggest-selling pop record of 1947, it must have seemed as though absolutely anything was possible. Bullet Records had been formed with a logo featuring a bullet speeding toward a target above the commendably hopeful, if not always accurate, legend 'Always A Smash Hit.' In reality, Bullet was more a shot in the dark in 1945. Yet within ten years there was a thriving recording industry in the city. Soon Elvis Presley would record there and bring rock 'n' roll with him. Already, a prophetic song, Music City USA, had been written and recorded in Nashville. It was released in 1950 when Nashville's music business was becoming rather less of a shot in the dark. During the twenty-five year genesis of this project, I have been frequently haunted by a classic cartoon based on a joke by the late British satirist, Peter Cook. Two strangers find themselves face-to-face at a party. One volunteers enthusiastically, "I'm writing a book." With poker faced realism, the other replies, "Neither am I." Much of this text was started over twenty years ago, based on a series of personal interviews conducted during the Seventies but never published. When I had first sighted Nashville in 1971, it was as an aspiring music writer looking through the windows of a bus out of New York. The Greyhound carrying Colin Escott and I had wound it's way out of the hills of east Tennessee through a glorious early morning summer mist when we saw a tour bus, eastbound out of Nashville. 'The Kitty Wells Show' was emblazoned on the side. It seemed to be a sign that our quest for roots music would fare well in Nashville, despite the fact that even then Kitty and her fellow stars from the Fifties were well past their commercial sell-by date. Tradition was an important part of the image that Nashville cultivated, but on arriving in town we soon found that the Nashville of the post-War recording pioneers had in reality all but disappeared. That this project has now come to fruition reflects the enthusiasm and assistance of many people. Bear Family Records is the only company in the world to contemplate such a project. Colin Escott is probably the only person who could have motivated me to embark on another series of interviews and to finish something in CD form that had lain half completed as a book for far too long. Colin has helped edit the text and has contributed vital insights and details to this story. Not least, he has tried to counter my inclination to capture the story in real time by recording and nailing down every detailed fact that presents itself. He has an unparalleled ability to summarise in a way that enhances rather than diminishes the story. Also inspirational was the detailed knowledge of record collectors Dave Sax, Chris Bentley, Phil Tricker, and Al Turner. Significant input was also made by Doug Seroff, Hank Davis, Bill Millar, and Kevin Coffey. Over the years I gained navigational aid and encouragement, discographical research and general help and enthusiasm from Bob Pinson, Wayne Russell, Tony Russell, Charles Wolfe, Richard Peterson, John Rumble, Lars Lundgren, Bob Laughton, Ray Topping, Bob Fuller, Robert Loers, Daniel Cooper, Bruce Bastin, Tony Collins, John Pearson, John Broven, George Moonoogian, and others I am sure I have quite unforgivably forgotten. Looking back over a mountain of correspondence, I found a large pile of letters from Bill Daniels, full of information, ideas and enthusiasm, and as much as anything else I am glad not to have wasted his efforts. I am also pleased for Dave Sax, who made a tremendous contribution throughout despite inadvertently making the ultimate sacrifice when a pile of 78 records were broken. My main debts, though, are to those who allowed themselves to be interviewed and from whose reminiscences and supply of factual data Colin and I have been able to piece together this booklet. This really is their story. Interviews by Martin Hawkins with Joe Allison, Howard Allison, Chet Atkins, Harold Bradley, Owen Bradley, Paul Broome, Jim Bulleit, Bill Beasley, Reynold Bubis, Louis Brooks, Hutch Carlock, Hugh Cherry, Dottie Dillard, John Dunn, Al Garner, Chuck Gregory, Buddy Harman, Bobby Hebb, Helen Hebb, Tommy Hill, Frank Innocenti, Ted Jarrett, Dee Kilpatrick, Christine Kittrell, Dean May, Kenny Marlow, Jay Miller (via John Broven), Cam Mullins, Murray Nash, Gene Nobles, Shannon Williams, Mac Wiseman, Randy Wood (via Polly Mitchener), Red Wortham, Cal Young, and Ernie Young (via Howard Allison). Interviews by Colin Escott with Alan Bubis, Rachel Bulleit, Chuck Gregory, Frank Innocenti and Murray Nash. 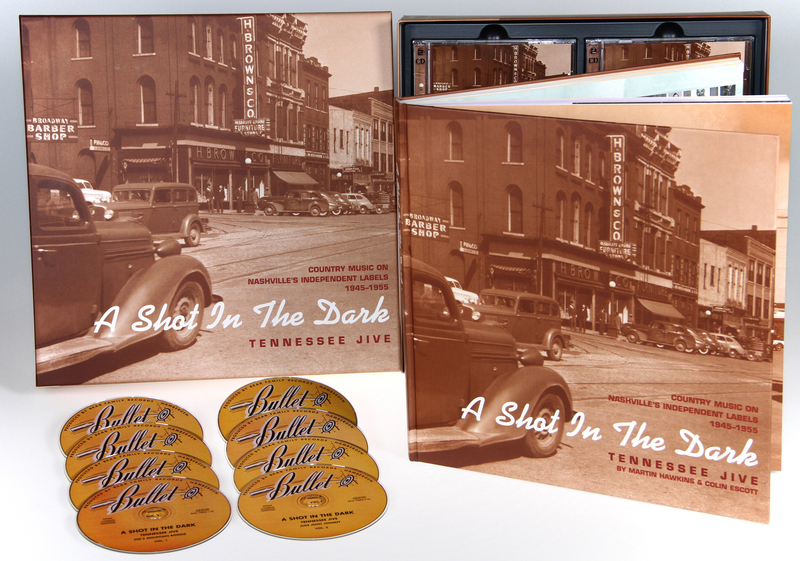 Customer evaluation for "Tennessee Jive, 1945-1955 8-CD-Box & 276-BOOK"